Stratford P erth Museum received an incredible artifact donation today from local war historian and a great friend of the museum, Philip Fowler. 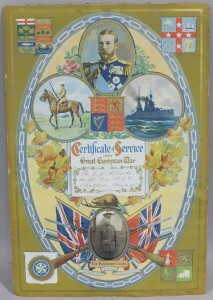 It is a poster-sized document given to Stratford soldier J.J. Clarke and is entitled a Certificate of Service in the Great European War. It is a great artifact, in amazing condition and most remarkably, the date on the certificate is 100 years ago today – November 16, 1915.